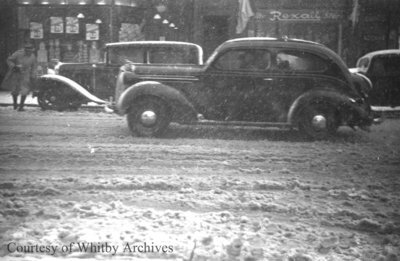 A black and white negative of Dundas Street West during a snow storm in April of 1938. In this view a car is visible driving west on Dundas Street and an unidentified man is walking to his car on the left of the photograph. Dundas Street West in Snow, April 8, 1938, Marjorie Ruddy. Whitby Archives A2013_040_741B.